Ahh! – a package arrived from Finland, containing this forgotten jewel. 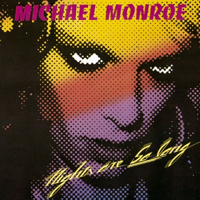 The first solo album by Michael Monroe from Hanoi Rocks. Only released in Finland (and Japan) and consequently difficult to get a hold of. Apparently Mr. Monroe mainly considered this album to be a kind of demo, a ticket to bigger things to come. And so, while it mostly only reached the shops in his native country, quite a number of copies must have been sent out to the press around the world. The first copy I got my greasy hands on was borrowed from a friend of a friend who worked at a local radio station. And amazingly there was even an article on the album in one of the big Danish papers around this time. I bought my own copy of the LP in Paris, in the giant Virgin store that carried all sorts of strange imports. But unfortunately this LP has been damaged when moving apartments, and so I’ve been on the hunt for it for some time. Finally Amazon yielded one affordable copy – the 2004 Finland-only remastered CD. Now this comes off as kind of cheap. The booklet just shows front and back of the original cover, there are some differences in the titles compared to the LP, and the spine even says “Michael Monroes”! But the sound is good, and you gotta love the inscription “24 Bit Digitaalinen re-masterointi” !! One little detail is missing though: on the spine of the original Finnish LP (Yahoo Records YAHOOLP105) the title “Nights are so long” has the “so lo” in purple and not in white as the rest of the text (clever). This is not reproduced on the CD. Another detail is that on the LP the tracks 8 and 9 was actually labelled tracks 3 and 3b (on side 2). Of course this feature is lost on CD. But what about the music?!! Well, it’s typical Monroe stuff – high energy rock’n’boogie, with great hooks both in riffs and lyrics ("You can't put your arms around a memory"), some sax and other tricks giving that 50’s feeling that’s also found in Hanoi Rocks’ music. It's a short, precise and very entertaining album, basically all songs are hits. My favorite track is the closer “Keep It Up”, a high octane three chord crusher that we actually tried to play (unsuccessfully) in the earliest incarnation of the band. Great stuff, although Mr. Monroe is of course an acquired taste. If you’re disturbed by this peculiar oldies rock feel and the man’s somewhat flat vocal performance, then this may not be for you. But it remains my favorite Monroe/Hanoi album, and I’m thrilled to once more own a playable copy. So, if you stumble upon this in a box of old records, get it – it’s worth it. Keep it up! So came and went the 18th of September and killed off the presumably final hope of an independent Scotland for the first time in more than 300 years. My deepest sympathy goes out to all whose dream died yesterday. Not many years ago, even the chance to vote on the issue would have been considered unrealistic, and then independence was suddenly within reach. I can only imagine what a blow it must be. As a longtime supporter of all things Scottish, the referendum on Scottish independence was a big thing for me – more so than a Danish election would be (one lying semi-fascist or another, what difference does it really make?). But alas! – it was not to be the big party we had hoped for. Once more, pragmatism and the fear generated by the threats of corporations, moneymen and all kinds of reactionary powers have prevailed over dreams, imagination, pride and freedom. A scenario that, sadly, seems to be another thing the Scottish and Danish peoples have in common. A scene from a famous movie shows a couple of lads looking out over the amazing Scottish countryside. One of them asks passionately: “Doesn´t this make you proud to be Scottish?! !” only to be met with the retort: “It´s SHITE being Scottish! !” – Well, today it truly must be. For the guitar geeks out there I just thought I´d share a picture of my new pedal board. One of my friends who is a carpenter (so he claims) has been kind enough to build the board to measure. Only, I can easily foresee that I’ll fall in love with some new pedal along the way, and then it will all have to be changed around. Plus, hidden below the “top floor”: T-Rex Fuel Tank Chameleon (power supply). Hello friends! Just thought I´d share this – some of you may have spotted it already. I have found a wonderful typo in the booklet of “The Shadow Cabinet”. In the song “I Shall Not Yield” there´s a bit that goes: “Gods of Life…blablabla…You may have woven this one´s lifethread of a foul and poisoned string…” Only it actually says “fowl” in the booklet. I know I´ve said many harsh words in the past about people screwing up my product when I´m not constantly looking over their shoulder. But this error I will claim full credit for myself. As I narrated this part myself on the album, no one else saw the lyric sheet, and so no one questioned the spelling. And since I´ve probably done the proof reading in all haste one late night, the thing has just carried itself over into the final booklet. Anyway, I think it makes for a wonderful image of divine powers weaving people´s destinies out of bits of string and, well, poultry…! Reminds me of something I read about old Master Tolkien. In correspondence between Tolkien and one of his sons they jokingly referred to the household´s chickens as “the fouls”, since the winged creatures apparently used to make a right mess. Hello and welcome to my little corner of the webpage! I imagine that this will be a sort of "off topic" section, although topics are likely to be related to Wuthering Heights, of course. I´ve got no definite plan, but I suspect I might post stuff about my musical influences, interesting records from my collection, guitar nerdy stuff and general ranting and raving. Suggestions are welcome!